Misalignment between the mechanical joint of an articulated AFO and the cor­responding anatomical joint can signifi­cant­ly affect the device’s mechanical properties, particularly resistance and stiffness, which can impair AFO effective­ness and negatively affect proximal joints. When working with articulated ankle foot orthoses (AFO), it is essential to make the artificial joint (either metal or plastic) in alignment with the anatomical joint. The importance of alignment has been emphasized in orthotic education and clinical practice, and practitioners have some rules to guide them. One common recommendation, for example, is that the mechanical joint be set distal to the anatomical joint instead of proximal so the brace will not pull the foot up and out of the shoe as the patient walks. However, little scientific evidence on AFO alignment is available. A few attempts have been made to better understand the effects of misalignment between anatomical and mechanical joints. In an orthotics education manual used at New York University (NYU),1 the effects of joint alignment in a traditional AFO were well illustrated using a simple yet informative geometric model. 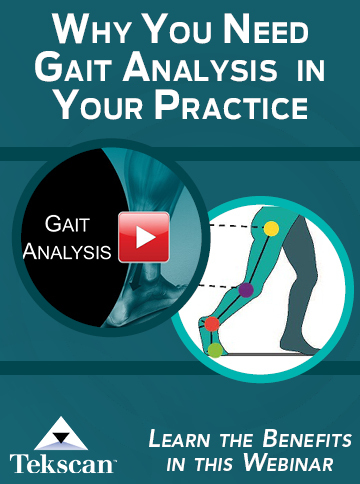 The concept was revisited in a 2007 study, which presented a simple geometrical model to demonstrate the effects of joint alignment on calf band motion.2 It is clear anterior and posterior misalignments will lead to more calf band motion than proximal and distal alignments and that the simple geometrical model could help practitioners better understand calf band motion. 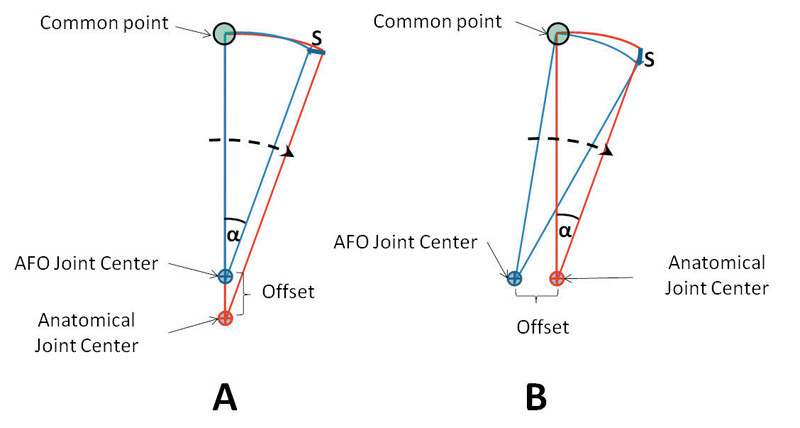 However, the way in which joint misalignments influence AFO joint mechanics in more realistic settings remains unclear. Figure 1. Illustration of the strap motion induced by joint offset. A: Superior alignment. B: Posterior alignment. The anatomical joint corresponds to the center of the motor shaft; S = change in distance between the common point (attached to the strap) and the AFO joint center; αα= angular displacement. In our recent study,3 we used a custom ankle device driven by a servomotor to quantitatively evaluate the effects of joint alignment on the mechanical properties of an articulated AFO fabricated with a Tamarack Flexure Joint (free motion and dorsiflexion-assist with three durometers: 75, 85, and 95). We used a plaster mold shank as a surrogate limb on which to position the AFO. The center of the motor shaft was used to mimic the anatomical ankle joint axis. 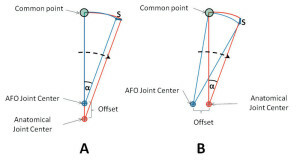 The AFO joint alignment was systematically changed with respect to the center of the motor shaft, resulting in testing of five alignment conditions: centered; 10 mm superior; 10 mm inferior; 10 mm anterior; and 10 mm posterior. The footplate of the AFO was positioned in a postoperative shoe that was firmly attached to the motor shaft. The AFO was moved passively from 20° of plantar flexion to 15° of dorsiflexion at a speed of 10°/s. The mechanical properties of the AFO system—including index of hysteresis (an index to quantify the energy dissipation during unloading), passive resistance torque, and quasistatic stiffness—were quantified at prescribed ankle joint positions (neutral and 5°, 10°, and 15° of plantar flexion). Optimal alignment (i.e., central alignment) was associated with minimum resistance and stiffness. Misalignments clearly demonstrated effects on the AFO’s mechanical properties, though those effects were variable. Specifically, significantly higher resistance and stiffness were associated with posterior and anterior misalignment than other alignment conditions. Our study, for the first time, demonstrated both experimentally and quantitatively that misalignment influences the mechanical properties of the articulated AFO. By taking into account the whole system including both the AFO and the foot/ankle complex, it appears that the changes are attributed to an interaction between the device and the foot/ankle complex. The hypothetical motion/stress could be illustrated using an approach similar to one found in the NYU orthotics manual. The magnitudes of strap displacement induced by misalignment in the anterior-posterior direction and in the longitudinal direction are comparable (for example, the changes in strap displacement, S, for superior (A) and posterior (B) alignments were 3.473 mm and 3.472 mm, respectively, with 20° of joint rotation and 10 mm offset based on basic trigonometry, as seen in Figure 1. However, the directions of strap displacement are different. The displacement is more horizontal when misaligned longitudinally and more vertical when misaligned in an anterior-posterior direction (Figure 1). In addition, misalignment in the longitudinal direction will cause more tangential stress on the foot because of the hypothetical relative motion between the AFO and the foot/ankle complex (Figure 2A). Similarly, misalignment in anterior-posterior direction will cause more normal stress on the foot (Figure 2B). The effects are also closely related to the length of the AFO footplate and leg section, which are mechanically analogous to the length of moment arm (i.e., the longer the length, the larger the strap motion). Using a simple geometric model has helped us gain some basic understanding of the interaction between the AFO and the foot/ankle complex. However, the geometric model appears to have been oversimplified, in particular regarding its assumption that there is no relative motion between the foot and foot plate. In addition, although the calf band motion was emphasized, no attention was paid to the potential increased stress on the foot/ankle complex. Experimental and quantitative studies allow us to evaluate these interactions from a more systematic perspective in a more realistic setting. However, we are still far from fully understanding exactly how and to what extent AFO alignment will affect the foot/ankle structure and surrounding tissues. The challenge is mainly due to the complexity of the anatomical structures and the mechanical properties of the tissues. Figure 2. Effects of joint misalignment on the foot. A: Superior alignment. B: Posterior alignment. The yellow and red circles with black crosses represent the anatomical joint center and the mechanical joint center, respectively. With the mechanical joint aligned superior to the anatomical joint, the foot will see more tangential stress pointing anteriorly (red arrows). With the mechanical joint aligned posterior to the anatomical joint, the foot will experience more normal stress pointing upward (red arrows). We believe our study and brief analysis above will serve as a starting point and stimulate more studies that will hopefully improve our knowledge in the near future. In continuing this line of research, some aspects of our previous study can potentially be improved. The study has some limitations involving experimental setup and technical restraint. For example, a single angular speed (10°/s) was used to load and unload the AFO. The angular speed of the ankle joint is constantly changing during ambulation, and a test protocol that can exactly follow the trajectory of ankle displacement during walking would better represent the real condition. In addition, in our study we used a surrogate rather than a real human foot/ankle. Using a surrogate has both pros and cons. It significantly simplified the test procedure by eliminating many of the variables involved in using human participants (e.g., compliance). However, a major drawback is the lack of the soft tissues, which in reality interact constantly with the AFO and play an important role in transmitting and attenuating mechanical stress. .
Our current knowledge on the effects of AFO off-axis alignment is mainly based on studies using a simplified system. For example, the ankle joint is assumed to be a simple hinge joint. In typical clinical orthotic practice the mechanical joint of the AFO is aligned with the anatomical joint horizontally (on an axis, passing through the distal tip of the medial malleolus at 25° of external rotation in the transverse plane, as described in the NYU manual. )1 This type of oversimplification of the ankle joint in clinical practice creates potential challenges in gaining a better understanding of the AFO-foot/ankle complex system. Anatomically, the ankle joint is oriented obliquely in both the frontal and transverse planes. The orientation of the axis is 8° of inversion and 6° of external rotation.5 Rotation with respect to the ankle joint will result in a triplanar motion. The system is even more complicated when one considers that the anatomical ankle joint’s position is consistently changing across its ROM. As reported in a study by Bottlang et al6 using a cadaveric model, the ankle joint is everted when plantar flexed and inverted when dorsiflexed. The trend in the transverse plane, however, is not systematic. For example, the ankle joint axis is internally rotated in dorsiflexion, but mixed results are observed when the foot is plantar flexed. The rotation axis in the transverse plane changes direction, from internal to external, when the foot is plantar flexed beyond 20°. Typically, an articulated AFO allows sagittal plane motion and restricts motion in the other two planes. Due to the triplanar displacement of the ankle joint, ankle dorsiflexion and plantar flexion will inevitably result in motion in the other two planes, which, when opposed by resistance from the AFO, will place additional stress on the foot/ankle complex. 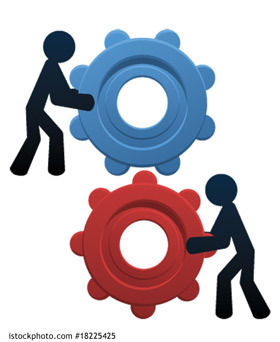 In practice, clinicians are mainly concerned about how much misalignment can be tolerated by the patient without adversely affecting function. To address these concerns, quantitative evaluations of anatomical ankle joint kinematics and kinetics are needed. These can be conducted experimentally both in vivo and in vitro. 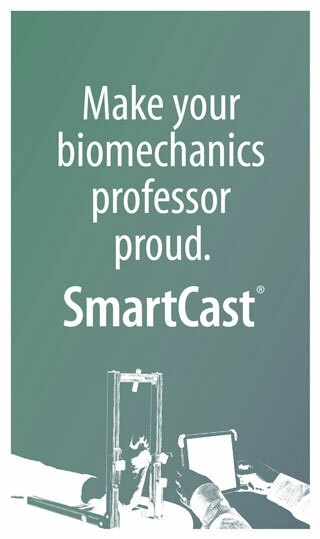 In vitro study allows easy access to bone and body segments, and more accurate registration of kinematics and kinetics. In addition, in vitro study allows us to evaluate the function of ligaments whose major role is to stabilize and guide joint motion passively.7 In their cadaveric study Bottlang et al6 systematically evaluated the effects of joint alignment between an external mechanical joint and the optimal axis of the ankle joint. In that study the translational offset was set from 0 mm to 10 mm with a step size of 5 mm. The study showed more energy is dissipated when the ankle is loaded with an off-axis translation in either the anterior or posterior direction. In addition, the study showed that less energy is dissipated when the mechanical joint is set distally with respect to the anatomical joint compared with other conditions. Muscle function, however, is completely eliminated in the in vitro study. During ambulation, peak Achilles tendon loading is 1500 N,8 which places significant stress on the joint. 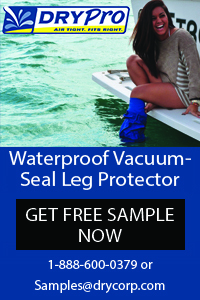 In addition, the ankle joint will respond differently under weightbearing and non-weightbearing conditions. Due to the few translational offset conditions and a lack of in vivo muscle activity and weightbearing, the results of this type of in vitro study are not sufficient to address the concern posed by practitioners. Alternatively, in vivo study might be promising given recent advances in imaging modalities (e.g., magnetic resonance imaging, fluorography, sonography). Currently, it is possible to quantitatively investigate 3D joint kinematics in vivo using either marker-based or model-based methods. For example, Roentgen Stereogrammetric Analysis (RSA) has is a proven, accurate 3D kinematic measurement method using predefined markers.9 The markers, usually made of tantalum, are attached to a rigid body (e.g., bone or implant). However, placing markers is a challenging and tedious procedure. Model-based RSA has therefore been developed to address this issue, with satisfactory results in registering 3D kinematics (e.g., those of orthopedic implants10). However, in vivo study has the following limitations. For example, it is challenging to evaluate the small ligaments and muscles that are predominant in the foot and ankle. In addition, it is difficult to evaluate tissue properties under realistic conditions (e.g., ambulation). We believe a combination of in vivo and theoretical (e.g., finite element analysis and musculoskeletal modeling) approaches will cross these barriers and provide a clearer picture of this complex system. The quantitative results lend some support to the widespread clinical practice in which the mechanical joint is preferentially set distally to the anatomical one. The analysis illustrated in figure 2A, in which longitudinal misalignment results in a tangential stress on the foot, also has important clinical implications. Tangential stress is one of the major risk factors for diabetic patients13,14 and repeated exposure might lead to ulceration. Therefore, the patient population also needs to be considered when adjusting AFO alignment. Alignment adjustment at the distal end will have a chain reaction effect and influence the proximal joints. For example, setting the ankle joint in plantar flexion in a solid AFO will shift the ground reaction force vector in front of the knee joint and force the knee into extension. In an articulated AFO, however, it remains unknown if a similar misalignment will impact the kinematics and kinetics at proximal joints in a similar way. Misalignment does influence joint stiffness, as shown in our study, and the altered ankle stiffness will likely lead to compensatory changes at proximal joints. In clinical practice, both plastic and metal joints are used. Plastic joints can better attenuate mechanical stresses on the foot/ankle complex due to their flexibility compared with metal joints. When metal joints are used, more attention needs to be paid to optimizing joint alignments to reduce these potential stresses. At this point, our knowledge of the AFO-foot/ankle complex system is still limited. Though we know that misalignment has adverse consequences, we do not know exactly how or to what extent it will affect the joints and tissues. Scientific studies and clinical practice are mutually beneficial and it is expected that with better understanding of the interaction between the foot/ankle complex and AFO, clinical practice will be significantly influenced. Fan Gao, PhD, is assistant professor and Susan Kapp, MEd, CPO, LPO, FAAOP, is associate professor and director of the Prosthetics-Orthotics Program in the Department of Health Care Sciences at UT Southwestern Medical Center at Dallas, TX. 1. New York University. Post-Graduate Medical School. Lower-limb orthotics. New York, NY: New York University, Post-Graduate Medical School; 1974. 2. Fatone S, Hansen AH. A model to predict the effect of ankle joint misalignment on calf band movement in ankle-foot orthoses. Prosthet Orthot Int 2007;31(1):76-87. 3. Gao F, Carlton W, Kapp S. Effects of joint alignment and type on mechanical properties of thermoplastic articulated AFO. Prosthet Orthot Int 2011;35(2):181-189. 4. Bowker P, Brader D, Pratt D, et al, eds. Biomechanical basis of orthotic management. Butterworth-Heinemann Ltd; 1993. 5. Inman VT. The joints of the ankle. Baltimore: Williams & Wilkins; 1976. 6. Bottlang M, Marsh JL, Brown TD. Articulated external fixation of the ankle: minimizing motion resistance by accurate axis alignment. J Biomech 1999;32(1):63-70. 7. Leardini A, O’Connor JJ, Catani F, Giannini S. Kinematics of the human ankle complex in passive flexion – a single degree of freedom system. J Biomech 1999;32(2):111-118. 8. Finni T, Komi PV, Lukkariniemi J. Achilles tendon loading during walking: application of a novel optic fiber technique. Eur J Appl Physiol Occup Physiol 1998;77(3):289-291. 9. Selvik G. Roentgen stereophotogrammetry. A method for the study of the kinematics of the skeletal system. Acta Orthop Scand Suppl 1989;232:1-51. 10. Valstar ER, de Jong FW, Vrooman HA, et al. Model-based Roentgen stereophotogrammetry of orthopaedic implants. J Biomech 2001;34(6):715-722. 11. Mariappan YK, Glaser KJ, Ehman RL. Magnetic resonance elastography: a review. Clin Anat 2010;23(5):497-511. 12. Saleem S. Elastography and its role in breast cancer screening. J Coll Physicians Surg Pak 2009;19(3):203-204. 13. Cavanagh PR, Ulbrecht JS, Caputo GM. New developments in the biomechanics of the diabetic foot. Diabetes Metab Res Rev 2000;16 Suppl 1:S6-S10. 14. Yavuz M, Erdemir A, Botek G, et al. Peak plantar pressure and shear locations: relevance to diabetic patients. Diabetes Care 2007;30(10):2643-2645.